A low viewpoint at Sunset , leads to an unfamiliar view of Coetan Arthur (3000BC) . 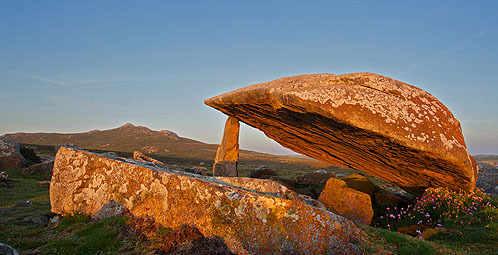 The remains of a Neolithic chambered tomb, (A Dolmen - Cromlech in welsh) , with a capstone 4m by 3m and 0.5m thick of Gabbro ( a coarse grained volcanic rock ) , supported by one large upright 1.5m high , other end rests on the ground. There are traces of a round barrow or cairn. Carn Llidi in the distance.